At the Selectboard meeting on June 4th Steven French and Jeremy Turner of Meadowsend Timber and Jenny Briot of Iberdrola Renewables presented a plan to erect three wind measurement towers on property just east of Windham. To erect these towers they must receive a certificate of public good (CPG) from the Public Service Board (PSB). These towers will meaure wind for a period of one year (during the meeting conflicting durations of six months and one year were stated) and the captured data will be analyzed to determine the feasibility of establishing an industrial wind farm on that site. 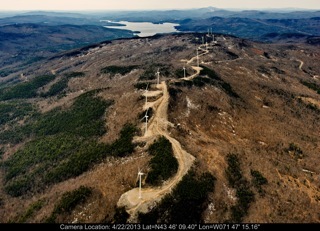 No information concerning the number of wind turbines or the actual siting of the 400′ tall turbines has been provided. Links to documents and site maps below. As required by the PSB all the adjoining property owners, and Selectboard and Planning Commissions in Windham and Grafton along with the Windham Regional Commission have been mailed a packet of information describing the project.